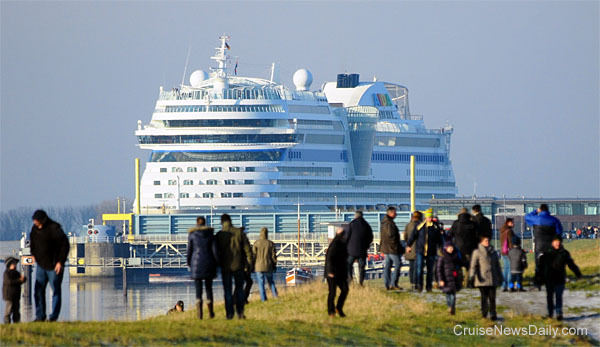 The 71,000-ton AIDAstella completed its river conveyance down the Ems River on Saturday (February 9, 2012) more than twelve hours earlier than originally planned, allowing it to begin sea trials already Saturday afternoon. AIDAstella is the the last of the series being built for AIDA by Meyer, so the completion was a cause for extra celebration. 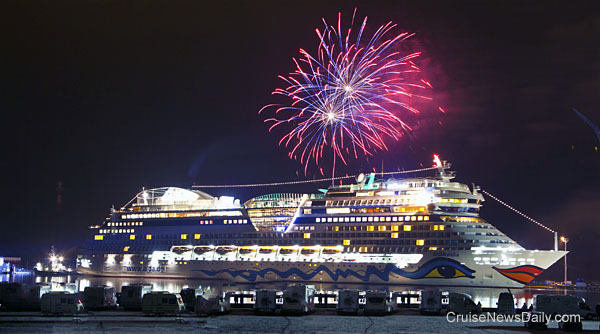 AIDAstella, therefore, departed Papenburg under a colorful fireworks display provided by the yard. The river conveyance is always a spectacle, and as usual, local people turned out along the banks to see a giant ship going down the river backwards. Photos and video courtesy of Meyer Werft and AIDA Cruises.